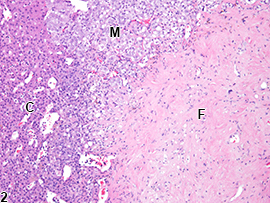 Adrenal gland - Fibrosis in a female F344/N rat from a chronic study. A large focal area of mature fibrous connective tissue (F) replaces parts of the normal cortex (C) and medulla (M); there is also focal mineralization (arrow) and a cluster of pigment-laden macrophages (arrowhead). Adrenal gland - Fibrosis in a female F344/N rat from a chronic study (higher magnification of Figure 1). There are scattered fibroblasts and blood vessels within the focus of fibrosis (F); C = cortex, M = medulla. Adrenal gland, Capsule - Fibrosis in a female F344/N rat from a chronic study. 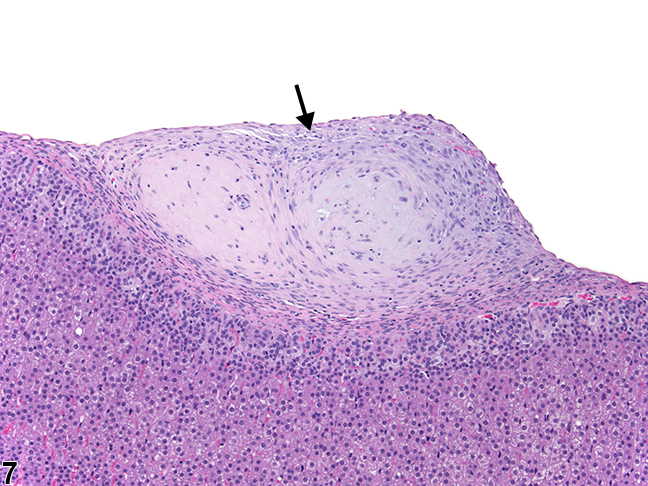 Focal fibrosis (arrow) results in thickening, distortion, and undulation of the adrenal capsule. Adrenal gland, Capsule - Fibrosis in a female F344/N rat from a chronic study (higher magnification of Figure 3). 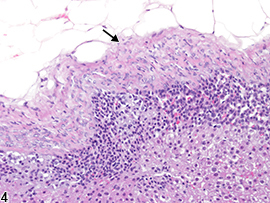 Fibrosis of the adrenal capsule (arrow) is characterized by mature collagen sheets interspersed with fibrocytes. Adrenal gland, Cortex - Fibrosis in a female Sprague-Dawley rat from a chronic study. 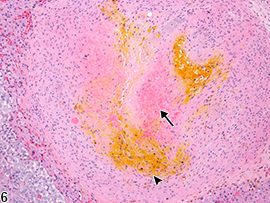 Focal fibrosis in the cortex is associated with an organized thrombus (arrow). Adrenal gland, Cortex - Fibrosis in a female Sprague-Dawley rat from a chronic study (higher magnification of Figure 5). 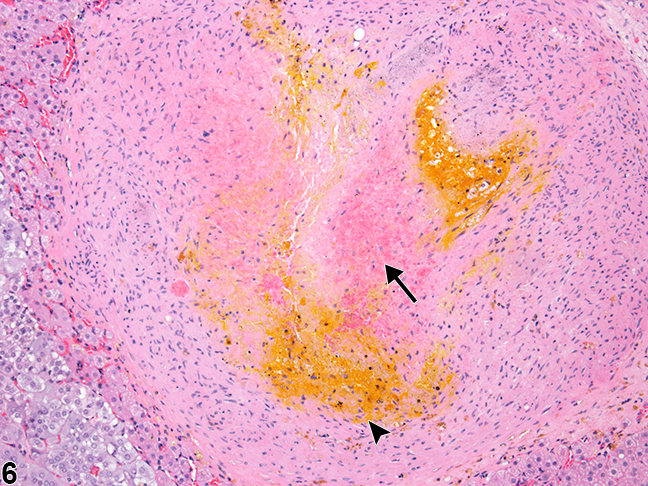 There is residual hemorrhage (arrow) and pigment accumulation (arrowhead) within the focus of fibrosis. 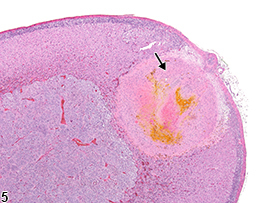 Adrenal gland, Capsule - Fibrosis in a male F344/N rat from a subchronic study. There is focal capsular fibrosis (arrow). 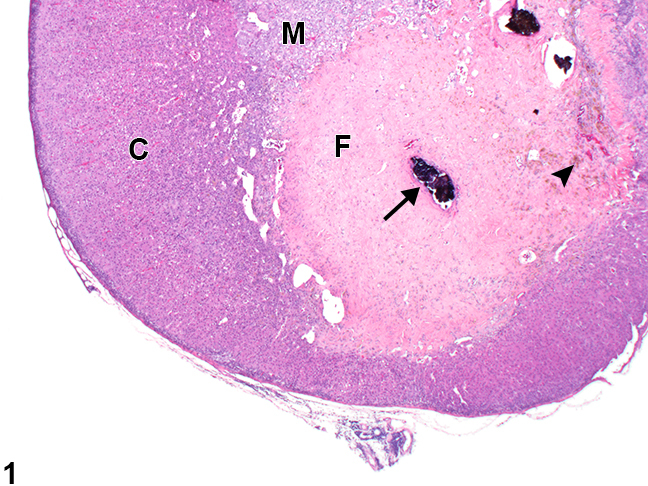 Adrenal gland, Capsule - Fibrosis in a female F344/N rat from a chronic study. 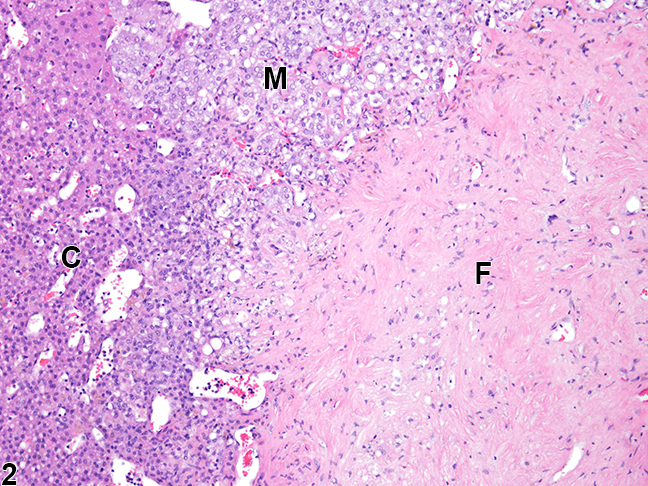 The capsule is thickened by fibrosis (F), most likely a sequela to the necrosis (Ne) in the adjacent retroperitoneal fat. C = cortex, M = medulla. 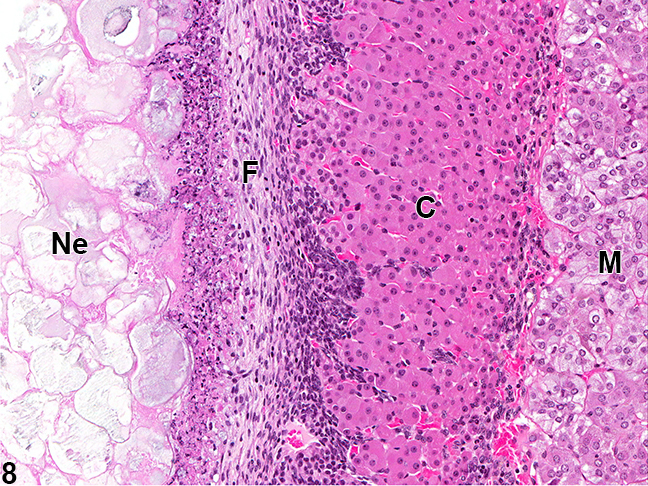 Adrenal gland fibrosis ( Figure 1 , Figure 2 , Figure 3 , Figure 4 , Figure 5 , Figure 6 , Figure 7 , and Figure 8 ) is an uncommon incidental finding in mice and rats. 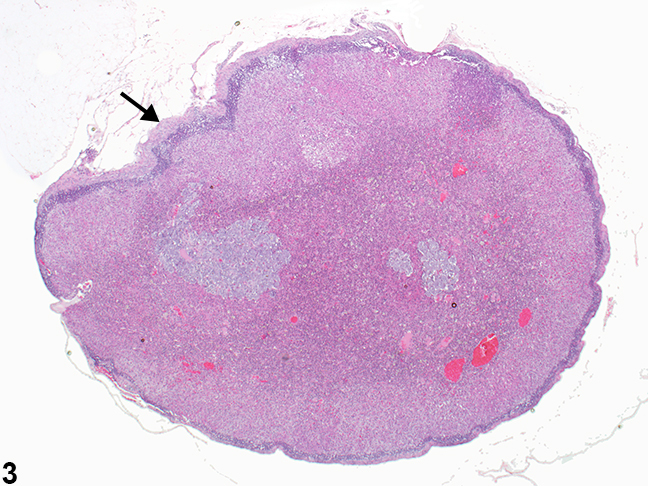 It is usually a sequela to other pathologic processes, such as necrosis ( Figure 8 ), atrophy, thrombosis ( Figure 5 and Figure 6 ), or inflammation. Adrenal gland fibrosis can be a focal to extensive change in the cortex and/or medulla ( Figure 1 , Figure 2 , Figure 5 , and Figure 6 ) and/or the capsule ( Figure 3 , Figure 4 , Figure 7 , and Figure 8 ). In all areas, fibrosis is characterized by focal to diffuse accumulations of fibrous connective tissue, which replace and/or distort normal tissue architecture. 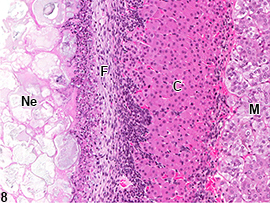 The fibrous connective tissue may be immature (with abundant fibroblasts and blood vessels and little collagen) to mature (primarily dense collagenous sheets with few fibrocytes and blood vessels). Adrenal gland fibrosis should be diagnosed and assigned a severity grade. A site modifier (i.e., cortex, medulla, or capsule) should be included in the diagnosis. If it is present in both the cortex and medulla, the site modifier may be omitted and the location described in the pathology narrative. A distribution modifier (e.g., focal) may be included in the diagnosis if necessary. Fibrosis secondary to other lesions (e.g., inflammation or necrosis) should not be diagnosed separately unless warranted by severity. 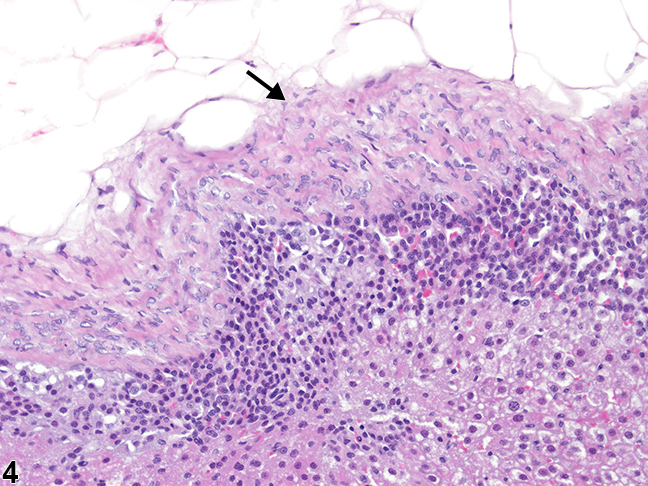 Features of fibrosis (e.g., mineralization or pigment) should not be diagnosed separately, though they should be described in the pathology narrative. National Toxicology Program. 1997. NTP TR-459. Toxicology and Carcinogenesis Studies of t-Butylhydroquinone (CAS No. 1948-33-0) in F344/N Rats and B6C3F1 Mice (Feed Studies). NTP, Research Triangle Park, NC. National Toxicology Program. 1999. NTP TR-481. Toxicology and Carcinogenesis Studies of Oleic Acid Diethanolamine Condensate (CAS No. 93-83-4) in F344/N Rats and B6C3F1 Mice (Dermal Studies). NTP, Research Triangle Park, NC. National Toxicology Program. 2010. NTP TR-557. Toxicology and Carcinogenesis Studies of β-Myrcene (CAS No. 123-35-3) in F344/N Rats and B6C3F1 Mice (Gavage Studies). NTP, Research Triangle Park, NC.